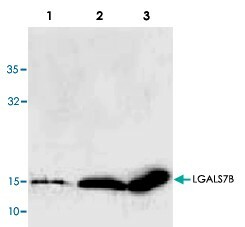 Recombinant protein corresponding to human LGALS7B. 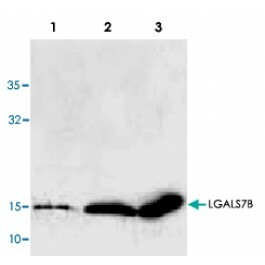 Rabbit polyclonal antibody raised against a recombinant LGALS7B. Store at -20°C. For long term storage store at -80°C. Aliquot to avoid repeated freezing and thawing.This product contains thimerosal: a POISONOUS AND HAZARDOUS SUBSTANCE which should be handled by trained staff only.